Olympic hero Tim Baillie launched the BBC Sports Unsung Hero Award 2012 in Scotland to search for and honour individuals from the world of grassroots sport. Nominations should be made for people who go the extra mile to change the lives of others through sport and who deserve to be recognised for their selfless work on the part of others. Votes can can be cast up until midnight on Monday 29 October. Once the nomination process has been completed, a shortlist of nominees in each area is chosen by a panel made up of BBC Sport staff, local sporting figures and other independent community figures, with a regional winner being picked by that judging panel. Baillie, who won the C2 canoe slalom gold medal with Etienne Stott in London, brought along his own unsung hero for the campaign launch. Alan Meikle was Baillie's coach for several years in Aberdeenshire when he was racing in junior competitions. Twice a week he made the three-hour round trip to Aberdeen from his home to take the promising young canoeist through rigorous practice sessions, giving performance advice and supervising his training programme. "Alan is an inspiration," said Baillie. "He is hugely enthusiastic and passionate about the sport - he would never appear to be tired at any time. He was very good at hammering his messages on where I could improve. "Training took place on the River Don in Seaton Park where there were some permanent slalom gates and we also did some training on the River Dee just up from the harbour. "One of Alan's big things then was that you definitely should not hit poles in training. For every gate I hit I would have to do an 'eskimo roll' at the end, which was a pretty severe punishment in those waters, particularly in the depths of winter! There was no shirking when you worked with Alan." Baillie also paid tribute to his parents Ken and Chris who drove him many thousands of miles to competitions in Wales and Nottingham during his junior years. 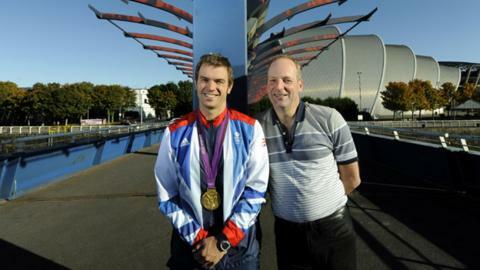 Athletics coaches Janice Eaglesham and Ian Mirfin won the BBC Sports Unsung Hero award for 2011. The pair formed the Red Star Athletics Club in Glasgow 21 years ago with only a couple of members. Since then the club has grown, with more than 150 disabled athletes trained by the duo over the years. Unsung Heroes from Nations and 15 regions attend the prestigious BBC Sports Personality of the Year in December, where an overall winner is announced. Nominations for the BBC Sports Unsung Hero Award 2012 can be made at bbc.co.uk/sportsunsunghero using a printable form. There is also a low-cost phone number people can call to request nomination forms - 0845 308 8000. Calls cost up to 5p/min from most landlines (an additional connection fee may also apply). Calls from mobiles may cost considerably more.